You can view the raw pictures here. 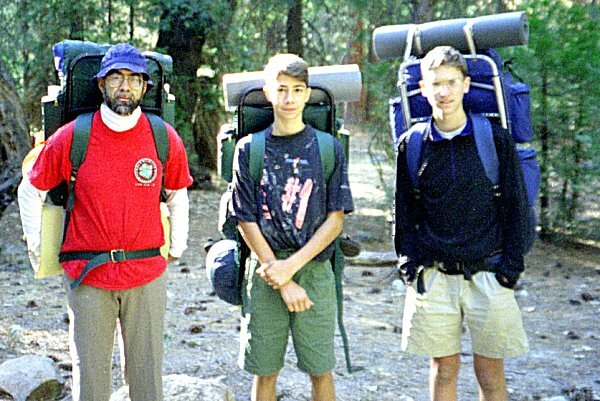 In 1993 I had taken Carrie, Eva, and Roy with me to the Sierras. Now it was the older brothers' turn: Ben and Nathan. We planned a more ambitious goal: the boys were 15 whereas the girls had been only 12. 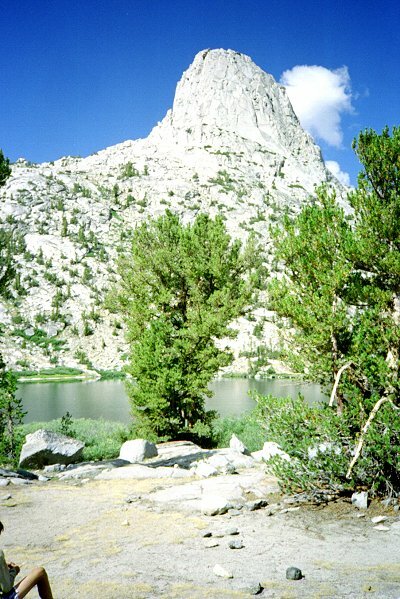 Our objective was to hike up Bubbs Creek to East Creek, cross Longley Pass, and climb Mt. Brewer. From there, we would return via Cloud Canyon. The trip we actually made was much different, but no less memorable. We spent the night at the Cedar Grove campground, and got an early start the next day. Here we are, all clean and fresh, set to go. Bubbs Creek would be a formidable crossing, if it were not for the bridge. 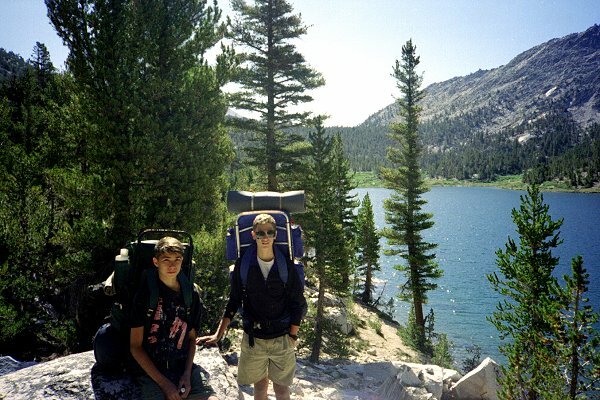 The boys were fast hikers, and we had no trouble making it to East Lake (shown here) and beyond to Reflection Lake the first day. I have made this hike myself several times, but I did not remember it as so long or as so tiring. We saw a bear, off in the distance, at Junction Meadow. We were sitting on a log eating lunch, and it came to check things out a couple times. It ran off when it was us moving, so we never felt threatened by it. After that, we did not see another bear. 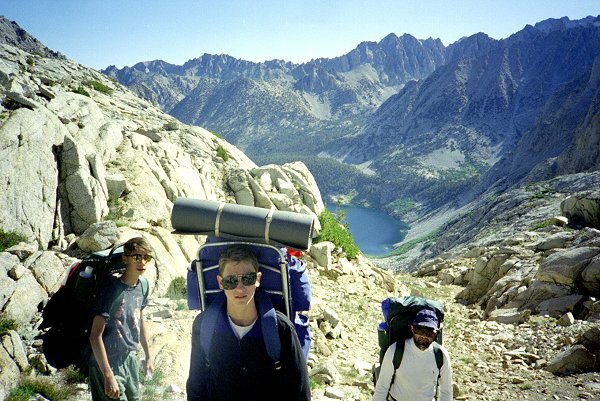 The next day we left the trail and climbed toward Longley Pass. 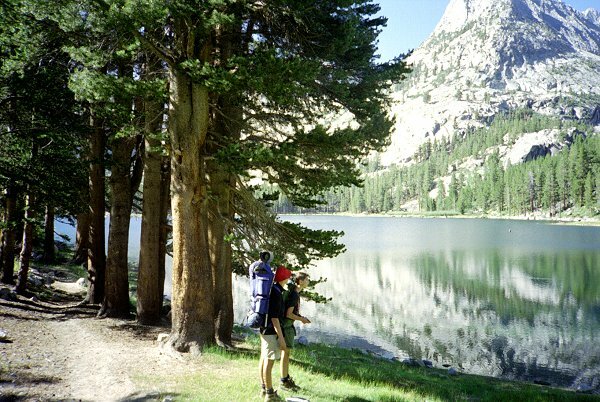 Here we are resting, looking down at reflection Lake. 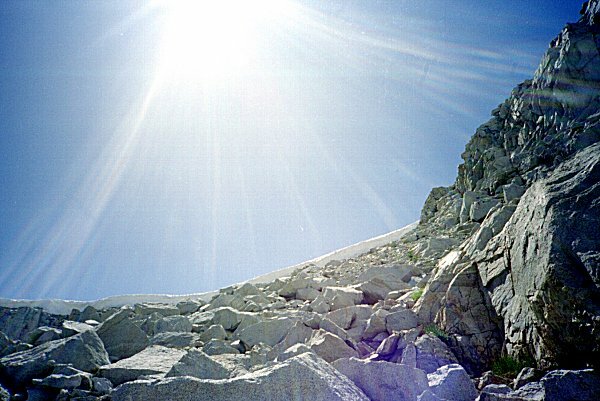 Progress slowed significantly, as we all began to feel the altitude and the cumulative effects of exertion. 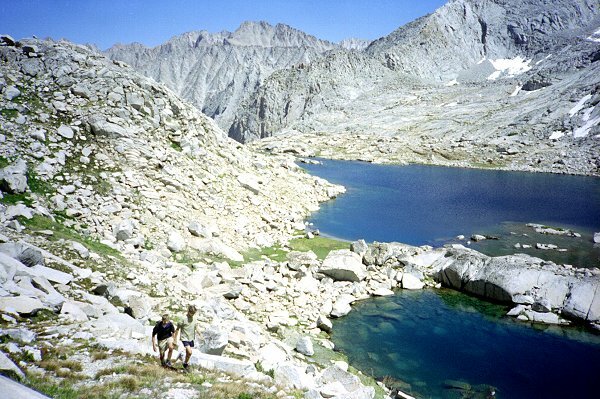 I had hoped to make it over the pass from Lake Reflection in one day. I remember doing that once before (but now I am not so sure). 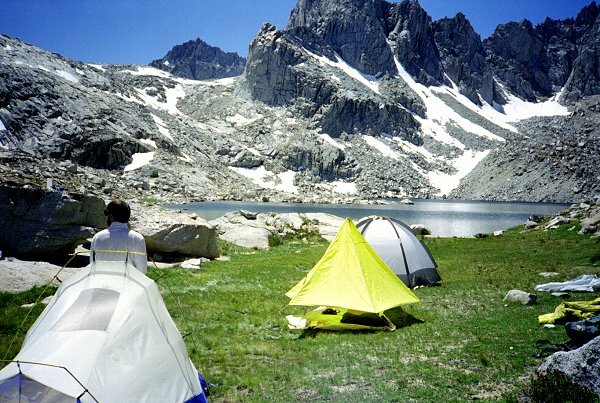 Anyway, we were beat and camped beside a group of magnificent lakes, with the pass in view. I have never before had trouble with blisters ... but there is always a first time. I was wearing new boots, but I think it was the socks that were the cause of my trouble. My feet hurt the first day, but I did not stop to do anything about it. They hurt a lot the second day, as the steep climbing off-trail pressed the boots against my tender blisters. I needed to spend a day off my feet. From camp, we could see that Longley Pass was blocked by snow. 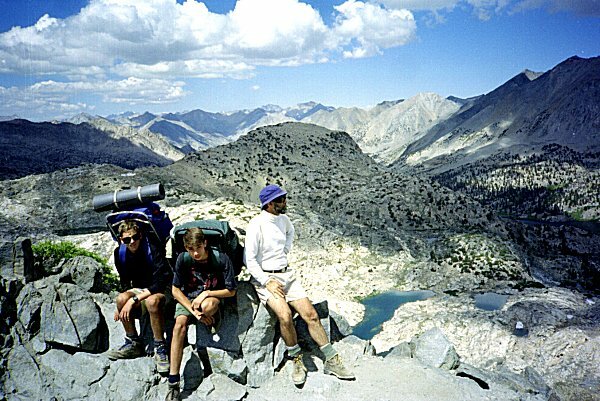 I suggested that the others hike up to the pass without their packs and scout out whether it would be possible to bypass the snow. The weather was clear and warm, perfect for exploring the upper basin. Also perfect for puttering around the lake and napping while my feat healed. When Roy and the boys reached the pass, they found it was covered completely by a snow cornice, overhanging several feet and about 20 feet high. They could not see a way around it -- it extended over the whole flat part of the pass to the cliffs on either side. They reluctantly concluded the route was impassible. I was not surprised that they found a cornice. 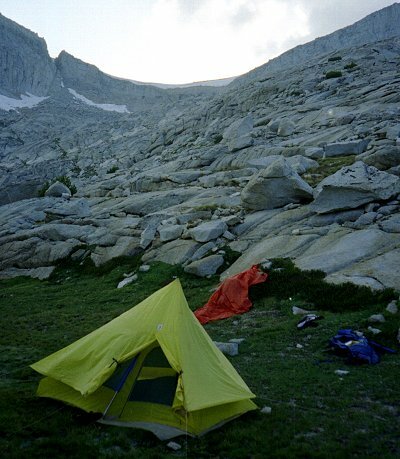 I had heard that this happens from time to time, and it certainly looked like a cornice from camp. 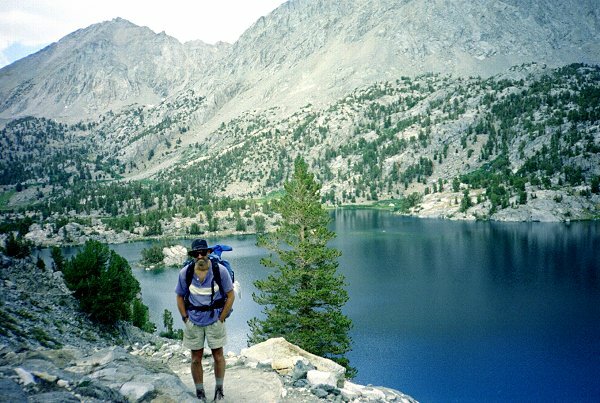 We decided to return to Bubbs Creek and try Glen Pass and the Rae Lakes loop. The next day we all headed back down toward East Creek. My feet were much happier walking down hill, and the rest helped as well. Our progress downhill was much faster than up, and we made it to East Lake in a couple of hours, as opposed to a whole day going up. 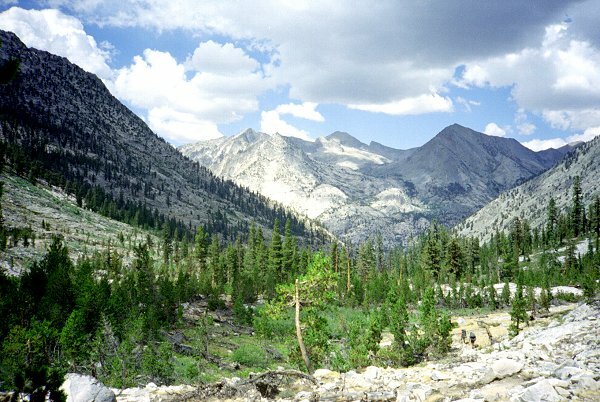 After descending East Creek, we crossed Bubbs Creek and headed up the canyon toward Junction Meadow. 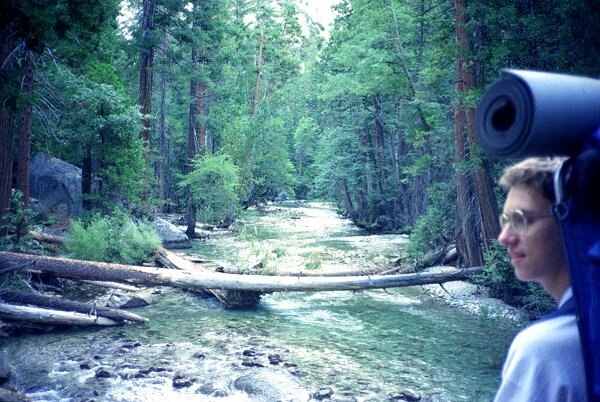 The stream was pretty high, and we were grateful that we could find a log to cross. Lead by the speedy boys, we quickly reached Junction Meadow and headed on up toward Charlotte Lake. 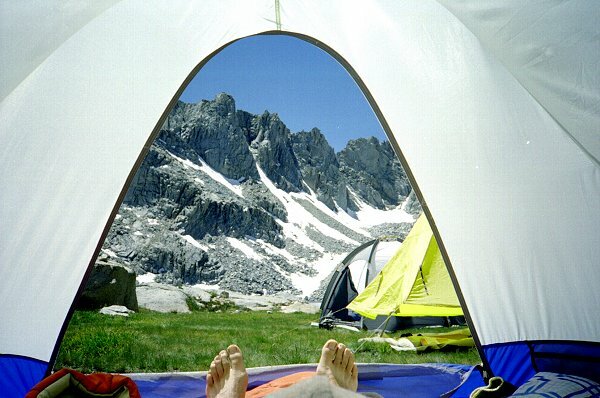 We got there in mid-afternoon, and found no one else camped there. We picked a good campsite and all lay down and napped after a long day of hiking. The next day we retraced our steps up to the trail junction, and headed for Glen Pass. 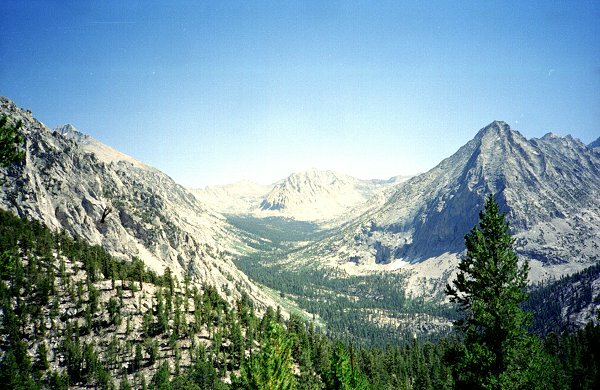 This is the last view of upper Bubbs Creek, looking in the direction of Forrester Pass. 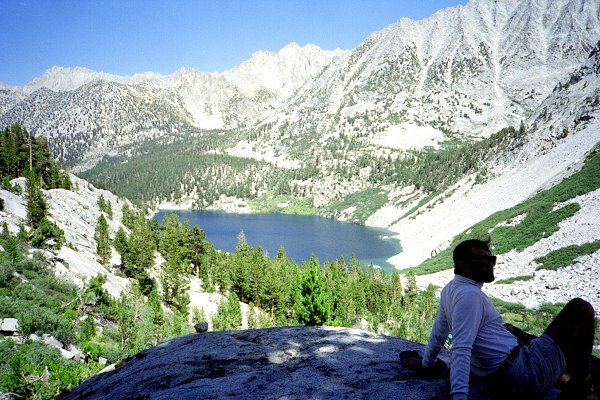 And this is the first view of the Rae Lakes Basin. None of us had ever been in this vicinity before, but we had heard about how beautiful it was. It did not disappoint us. We met many parties on the Glen Pass trail, and had to share the pass with a dozen people and a train of mules carrying supplies for a party of two photographers. The clouds passing overhead cast shadows over the terrain below, so that it was constantly changing in appearance. It was much more dramatic than I could capture on film. As we descended, the clouds thickened, so that by the time we neared the first lake it was beginning to threaten rain. We all broke out our rain gear, but we had to continue hiking because every campsite was occupied. We hiked several miles in an increasing rain, passing site after site claimed by other parties. 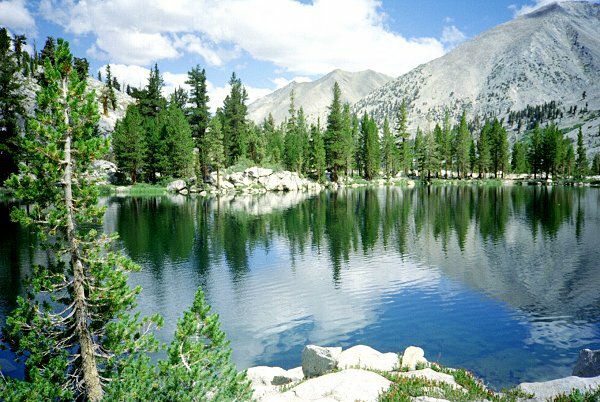 Finally, at the northernmost of the Rae Lakes we found a site, near a bear box, that was free. As we began setting up our tents, it rained harder and harder, with thunder and lightning crashing around us. We crawled in our tents as the rain turned to sleet and hail. This picture does not show it very clearly, but the ground was covered in a layer of ice pebbles. Eventually the clouds blew over, and we were able to cook out of the rain. The next morning it was bright and clear. We could hardly see Fin Dome across the lake yesterday, but not it stands towering overhead. 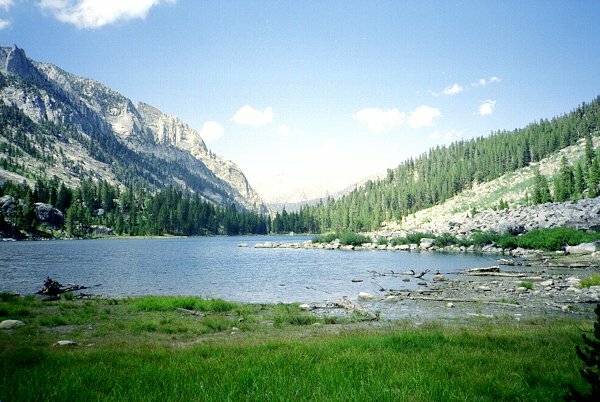 We passed Arrowhead and Dollar Lakes, as we proceeded down the canyon. At dinner time last night we met a woman with two small children, looking for the ranger's cabin. We looked around and found the cabin, but not the ranger. She told us she was worried that she had heart problems ! We were happy to see the woman and her kinds the next morning, apparently OK. We offered to keep an eye on her as she hiked out. She was grateful, saying she still thought she might be having a heart attack. Even though we were hiking pretty fast, she was going even more quickly, and did not stay close enough to us that we could have done any good. We caught up to her and her kinds a couple of times, but they always raged off again. The clouds again thickened, and it began to rain. 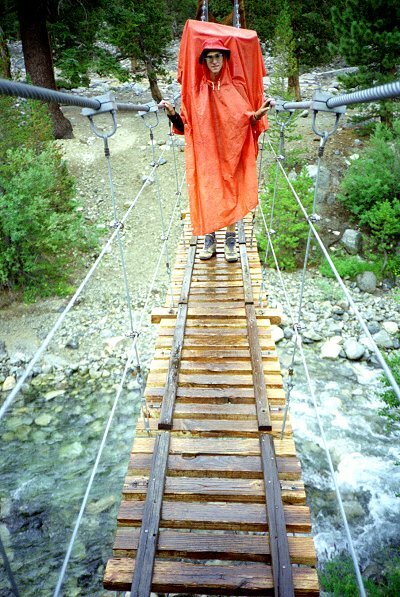 Crossing the suspension bridge at Woods Creek Junction was exciting because it was slippery in the rain. But it was definitely better than having to cross the stream, which was quite high. We kept on going down Woods Creek, through the rain, to Paradise Valley. 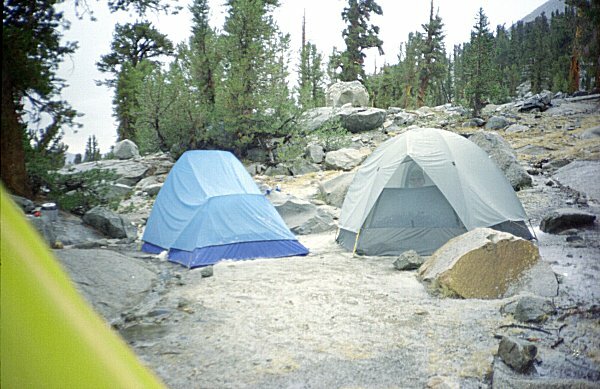 It was still raining when we reached the campground, so we set up our tents and cooked in the rain. Descending Woods Creek, we were passed by several parties of trail runners ! They had on shots, tee shirts, and fanny packs of water. I could not get one of them to stop long enough to talk, but I gathered they were doing the 60 miles Rae Lakes loop in one day. I wish I were in good enough shape to do that. On the other hand, what is the point of being in the wild if you mere hurry past it ? The morning was again dry and clear, so we hurried to get going. 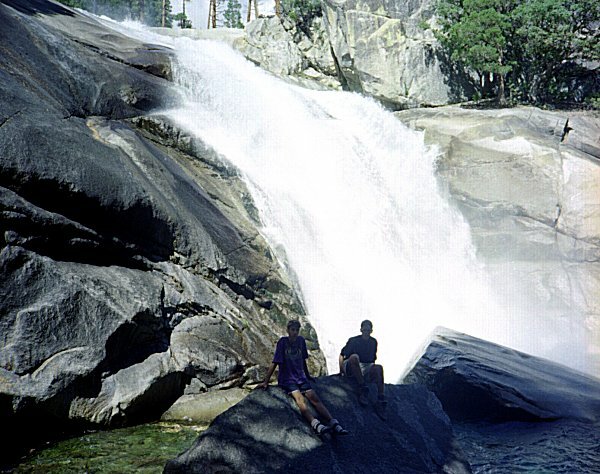 We made great time going down hill, stopping only to rest and enjoy Mist Falls. At the bottom of Bubbs Creek there is a charming area overgrown with a bamboo-like plant that I have seen nowhere else in the park. I wish I know what it was, and why it is here and nowhere else. 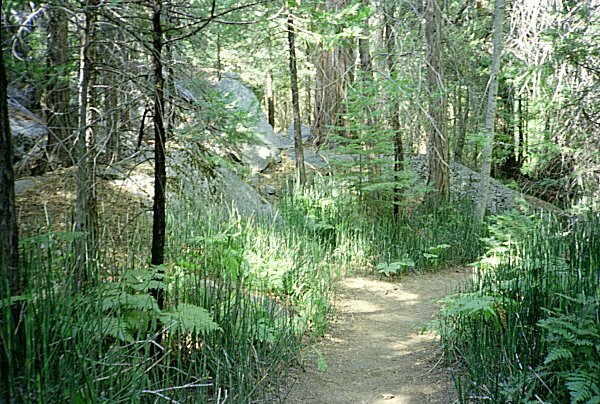 It is oasis of shade on an otherwise hot, dry trail. 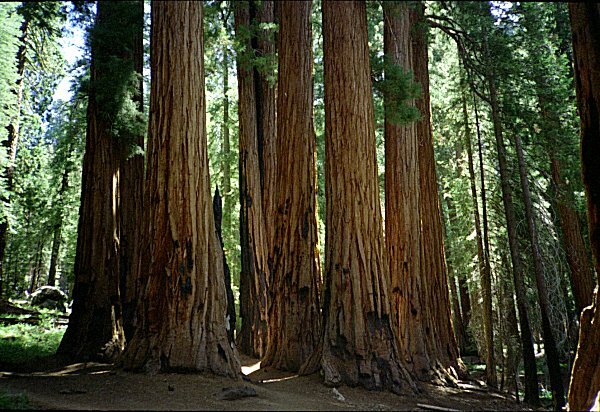 We arrived in Cedar Grove early in the afternoon, and decided to drive over to the Sequoia groves in the other part of the park. We all enjoyed the usual tourist sights: the groves of giant trees, Moro Rock, warm showers, etc. Although we did not achieve our initial objective, it was a wonderful trip through beautiful territory, fulfilling everyone's expectations.